As you have learned in other modules on history (Module Seven (B)), geography (Module Six) and politics (Module Ten), African colonies gained their independence from European colonial powers beginning in 1951 (Libya) and ending with the transition to majority rule in South Africa (1994). Regardless of how and when African countries gained their independence, most countries were economically underdeveloped. Although each independent African country had unique economic features, most countries inherited similar economic structures from their colonial experience. To understand the economic situation in contemporary post-colonial Africa, it is important to remember the economic structures inherited from the colonial era. Most African economies at independence were centered on the production and export of a single commodity, be it agricultural or mineral. (click here to view table of Basic Economic Data) Economists label economies that are dependent on a single commodity as mono-economies. You have learned that in order for economies to develop, specialization and diversification are essential. 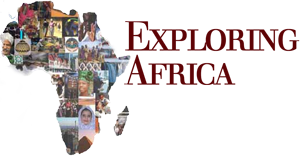 Independent African governments had to develop strategies for economic diversification and specialization. This was not an easy task given that the colonial economic systems were not oriented to diversification. Most African countries inherited under-developed commercial, transportation, and communication infrastructures. Economic diversification and growth is dependent in part on developed networks of communication and transportation that facilitate the easy movement of goods, services, capital and labor. You know from your study of the factors of economic production that one of the most important factors of economic production and economic growth is people. All production depends on human labor. Specialized production is dependent on a skilled and educated workforce. However, most colonial governments spent very little money on schooling. Consequently at independence, African countries faced a severe shortage of skilled people, an absolute necessity for economic growth and development. To give just one example, at independence in 1960, the Congo (Democratic Republic), a country the size of the United States east of the Mississippi River, had fewer than 20 college graduates! These are some of the economic realities confronting African governments at independence. In addition to these harsh realities, African countries wanted desperately to address legitimate needs and aspirations of their citizens. As you will remember, central concerns of the nationalist movements (Module Seven (B) and Module Ten) were the lack of economic opportunity and social justice. Pro-independence nationalist leaders, responding to the aspirations of the people, demanded greater access to schooling, more adequate health care and housing, safe drinking water, and economic opportunities, just to list the most important demands. Having championed these demands, the first post-colonial governments had to make an attempt to deliver on these aspirations. However, meeting these aspirations would necessitate huge government expenditures, which in turn would be dependent on government revenues. Government revenues come primarily from taxing the productive sectors of the national economy. So, it comes back to economic growth and development. To meet the legitimate aspirations of the people, economic growth and development are essential. On achieving political independence, African governments clearly had to develop and enact policies that would stimulate economic growth and which would help citizens meet their social and economic aspirations. Following the advice of many international economic experts, including professionals from the World Bank and the International Monetary Fund, leaders of African countries established policies aimed at strengthening their economies through diversification However, there are a number of different strategies which governments can take in attempting to promote economic development. In the 1960s and 1970s, international economists promoted two competing strategies for generating economic growth and development. Economic growth and diversification through import substitution. Economists promoting this plan pointed out that most African countries were mono-economies, and, as such, these countries were dependent on importing almost all of the non-food items they consumed. An import substitution policy would promote diversification and growth through a strategy that would lessen dependence on expensive imports. An added benefit to this strategy, according to its proponents, was the emphasis on industrialization. They pointed out that economic development occurred in Europe, Japan and North America through industrialization. Import substitution, proponents asserted, would promote diversification through industrialization. Economic growth and diversification through diversification of exports. Economists promoting this perspective argued that the development of import substitution industries was very expensive, noting that postcolonial African governments did not have the financial resources to finance industries. Moreover, these economists argued that there would not be sufficient interest on the part of international business to invest in new industries in Africa. As an alternative strategy, they promoted the diversification of the exports through the development of new exports–exports of goods that could be inexpensively produced in Africa. These economists believed that through the export of agricultural and mineral products, African economies would build up a surplus of profits, called foreign reserves, which could be used to invest in further economic diversification and growth. Proponents of an import-substitution plan disagreed with this approach. They asserted that dependence on the export of raw materials would perpetuate the economic dependency of African countries on a unstable and unfair international system, which buys raw materials cheaply and sells industrial goods at high prices. African governments were not faced with easy choices. What policy do you think you would have followed if you were an African leader at independence? Once African governments made the decision on which model of economic growth to follow, they were confronted with an additional economic dilemma of how to fund/finance their development plan. Large infusions of capital would be needed for either the development of import substitution or export generating industries. The question of funding economic projects was closely tied to the issue of ownership of economic resources. Whoever owned economic resources would have primary responsibility for raising money to finance the project under consideration. By the same token, those who owned productive resources would control the profits generated by the industry. In the 1960s, African governments had a number of different options for raising capital to fund development that were directly connected to issues of ownership. Private Enterprise: Private enterprise (capitalism) is a system in which economic resources, such as land, natural resources, commerce, and industry, are privately owned by individuals or groups of individuals. If African countries at independence were to follow a private enterprise strategy, resources such as land and minerals would belong to individuals or privately owned companies. In private enterprise, companies or individuals owning resources are responsible for raising capital (funds) necessary to begin or expand production. Colonialism, of course, left most African countries with little local capital. Consequently, if a free-enterprise strategy were to be implemented, African governments and local businesses would have to raise capital from outside the country, primarily from international businesses located in Europe, Japan, and North America. To attract international investments, African governments would need to have policies attractive to potential investors. For example, property rights would be guaranteed and companies would have the right to do whatever they wished with their profits, including sending them out of the country. This approach raised some concerns. Would international businesses be willing to re-invest some of their profits within the country, or would they send most of their profits out of the country? Would these businesses be willing to invest in their workforce by supporting education, health care, and housing? Or would their primary concern be the making of profit? How different would this system be from the colonial economic system that was primarily interested in the export of raw materials and not in diversified development? State Directed/Control: A second option available to African leaders at independence was that of state control. A system of state control would give the state ownership of a country’s natural resources. This system would allow the new government to develop an economic plan that was in line with what it felt was in the best interest of the country. In this system, the government would be responsible for raising the capital necessary for the development of new, or expansion of existing, businesses. How would the government raise capital? There were four potential sources of revenues. First, the governments could try to raise funds for investment through taxation. However, since African economies at independence were underdeveloped, there was little potential for raising necessary funds through taxation. Second, governments could borrow money from international lenders, either private banks or from non-private institutions like the World Bank. However, given that banks are a product of the free enterprise system, banks might be reluctant to loan large sums of monies to fund state controlled projects or businesses. Third, African governments could appeal to richer countries to provide them with grants (gifts of money targeted at a specific project) to help fund economic projects. While a number of Asian, European, and North American governments were willing to provide some development assistance, would these countries be willing to supply the large amount of money needed to stimulate economic development? Fourth, African governments could encourage international businesses to undertake joint business ventures in which the business would provide capital and expertise, while governments would provide natural resources and labor. Mixed Economy: A third option open to African governments was the development of a mixed economic plan, which combined elements of private ownership and control with elements of state ownership and control. Under such a plan, the government would identify certain areas of the economy in which private ownership and enterprise would be encouraged. Similarly, areas of the economy would be set aside for state control. This option would allow the government to attempt to attract capital from a wide variety of sources: international businesses, bank loans, direct grants from richer countries. It’s Your Turn to imagine yourself as a leader in an African country just after independence. You have to develop a policy for investment and ownership based on what you have learned. Looking back over the past forty years of since the end of colonialism, it is clear that African governments took many different approaches to promoting economic development. Most of the governments of Africa’s 56 countries followed a mixed approach to development. That is, they tried a combination of import substitution and diversification of exports. To fund these endeavors most governments did not follow either a strict free enterprise or state directed approach to funding development, but used a combination of strategies to foster economic development and growth. How successful were these economic strategies? The answer to this question will depend in part on the data (“facts and figures”) that you use to answer the question. One way to measure economic growth is tracing changes in the Gross Domestic Product (GDP). You will remember that the GDP measures in money terms the value of all goods and services produced in a country. Take a look at Table One (above) and Tables Two and Three. Table Two records the growth of GDP among all African countries from 1980 through 2015. Table Three measures the GDP per capita. That is, the total GDP divided by the population of the country. Which African country has had the highest rate of Average Annual GDP growth over the past thirty five years? Look back at the map that records the primary products and exports of African countries. What is/are the primary exports of this country? Have more countries’ GDPs annually grown by more than five percent or less than five percent? Have any countries annual GDP percent growth dropped instead of risen? Look at the earlier map that identifies natural resources and exports. Identify three countries that export petroleum. How rapidly did their GDP grow over the last thirty five years? Look at the earlier map that identifies natural resources. Identify five countries whose primary export is an agricultural product. How rapidly did their GDP grow over the last thirty five years? Based on the information you retrieved in answering the previous questions, what relationship, if any, is there between primary export and economic growth, as measured by GDP? Which African country has the highest per capita GDP? Make a list of the African countries whose per capita GDP was less than $500 per year in 1997. In how many African countries did the per capita GDP stay the same or actually decline over the past thirty five years? Most of these countries experienced growth in their GDP but a decline in their per capita GDP. How do you explain this difference? Based on the information contained in these two tables, how would you describe the overall growth and African economies over the past thirty five years as measured by GDP? What explanation can be given for the economic performance of African countries? Economic structures and practices put in place during colonialism may offer some explanation. The policy decisions made by African officials may also be partially responsible for economic performance. However, to gain a better understanding of the economics of contemporary Africa, it is important take into consideration the impact of globalization.